The Blue Whale is a marine mammal, that’s believed to be the largest animal that has ever lived, far bigger than even the largest dinosaur. They habitat the Antarctic Ocean, the North Atlantic, North & South Pacific and Indian Oceans. They are members of the order Artiodactyla and family Balaenopteridae (or ‘Rorquals’), the largest group of Baleen whales, which includes the Humpback Whale. Predators: No Natural Predators. However, there have been some Killer Whale attacks. 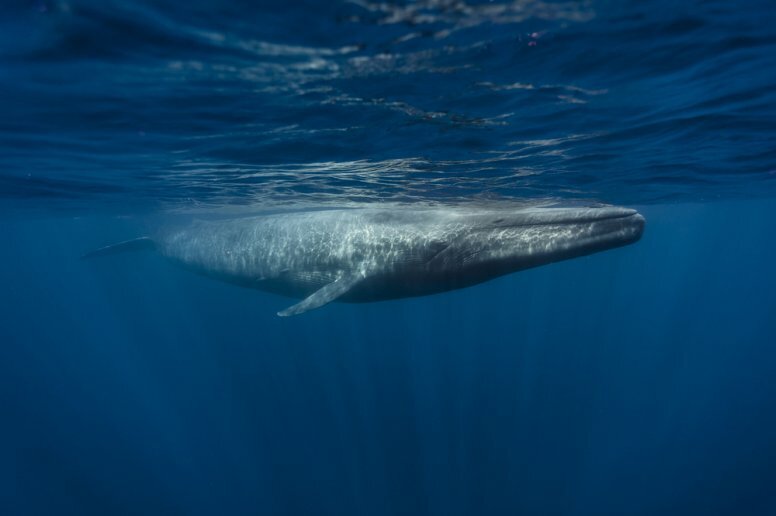 The Blue Whale (Balaenoptera musculus) prefer the deep ocean, rather than coastal waters or bays, and can be found living in any of the oceans located around the globe. They tend to spend the warmer months feeding in the polar regions, and will participate in extensively long migrations to the Equator as winter approaches. Blue Whales live typically between 80 and 90 years, with some reaching up to 110 years of age. They have a carnivore diet, but despite their size, these massive sea creatures prefer to eat some of the tiniest marine life. Blue Whales feast on plankton called krill, which is a small animal that resembles shrimp. Due to the relative sizes of both the blue whale and krill, they can consume as many as 40 million krill, or 8,000 pounds (3,600 kg) of it daily. Blue Whales can grow to over 30-metres in length, but are extremely graceful swimmers. They typically have a cruising speed of around 8-kilometres per hour, and can hit top speeds of up to 50 kph. They are also great divers, plunging down to depths of 500-metres, to seek krill to snack on. Because the blue whale is the largest animal to live on the planet, it has few predators. However, shark attacks and killer whales can injure or kill a blue whale. More commonly, they succumb to injuries sustained with collisions with large sea vessels. The global population of blue whales is uncertain, but based on research from the IUCN, the global total for the species is estimated to be between 10,000-25,000 and classed as endangered. 1. The mouth of the blue whale contains a row of plates that are fringed with ‘baleen’, which are similar to bristles. The bristles are used to filter food from the water that the whale takes in its mouth when feeding. A mouthful of water for the Blue Whale is about 5,000-kilograms of liquid and plankton. As the whale forces the water out of its mouth, the bristles act to capture and trap the food. The whale then licks the bristles clean with its massive tongue, which allows it to swallow the plankton. 2. The tongue of the blue whale is as big as an elephant. 3. The blue whale was once hunted for whale oil. In the 1900’s blue whales were extensively hunted, which severely impacted their population. Hundreds of thousands of them were massacred for their oil, which is obtained from their blubber. Historically whale oil was widely used in oil lamps, and to make soap and margarine. 4. Blue whales were hunted almost to extinction, until they were protected in 1966. 5. The blue whale population size is slowly increasing. 6. A blue whale weighs as much as 200 tonnes. Or, 150 Honda Civics. They are the heaviest animals known to ever live on the planet. 7. Blue whales make few friends in the water. 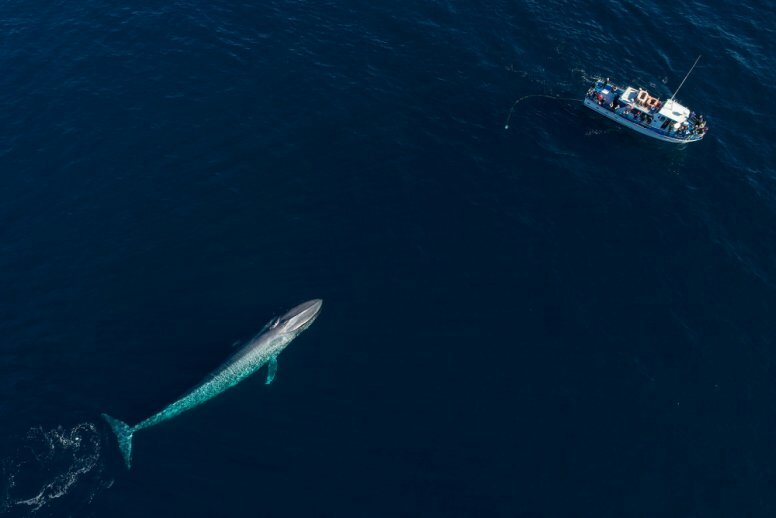 Although it is common for them to just swim around the many oceans on the planet alone or in a pair, the blue whale will from time to time swim in a small group. Where food is readily available, as many as 60 blue whales may come together. 8. The blue whale is not only the world’s largest animal, but also the loudest. The human ear can’t pick them up underwater, but the blue whale happens to make the loudest noise of any animal, up to 188 decibels, which is louder than a jet engine. The blue whale talks with low frequency moans, groans and pulses. 9. The blue whale has incredible hearing. Because the Blue Whale communicates with sounds that are such a low frequency, under the correct conditions, one can communicate with others and be heard as far as 1,600-kilometres away. 10. Although a mostly solitary animal, the blue whale forms bonds. Probably due to the long lifespan of the blue whale, it has the ability to form an attachment to another living creature that spends time with one. 11. Actions displayed by blue whales appear that they have feelings. This belief is backed up by how whales that wash ashore will show affection towards those who rescue them as if so say thank you. 12. The reproductive cycle for the blue whale is rather slow. Breeding occurs just once every three years. Pregnancy is usually between 11 and 12 months. 13. Following such a slow reproductive cycle, blue whale families are small. Usually females will give birth to just one calf. 14. A Blue whale calf is anything but a little baby. The newborn calf will weigh as much as 2,700-kilograms and measure 8-metres or more in length. 15. A Blue whale calf grows fast. The calf will gain roughly 90-kilograms of weight per day in its first year of life. 16. The Blue whale calf has a huge appetite. As it is suckled in the water, a calf will consume over 600 liters of mother’s milk per day in its first year. 17. Blue whale mothers nurture their young. A female will lift her newborn calf to the water surface in order for it to take its first breath of air. Other females that may be nearby will help by nudging the newborn in an effort to encourage it to break the surface and breathe. 18. Blue whales have a blowhole to breathe, similar to our nose! When one surfaces, it exhales through the blowhole at the top of its body. A cloud of pressurized air is sent as much as 9-metres in the air due to the force of exhalation. They tend to come up for air between every 5-15 mins – but can go for longer without breathing. 19. Blue whales have a huge heart. Aside from having feelings and showing affection, the average blue whale heart is as big as a mid-sized car. The beating of this massive heart can be heard as far as 2-mile away. Their blood vessels are so wide you could swim through them. What we are saying is, they are big. Very big. 20. The blue whale resembles a well-known sea craft. 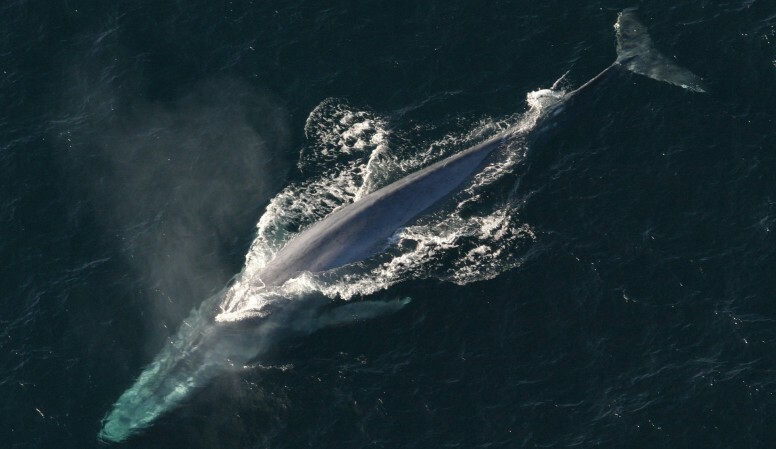 When viewed from above, aside from having fins and a fluke, the Blue Whale can easily be mistaken for a submarine – as it has the same basic aerodynamic shape. 21. The steering equipment is relatively small on a blue whale. They use their flippers for maneuvering around under water, but the blue whale flipper is just 12-percent of the overall size of the mammal. 22. Killer whale (Orcas) rarely attack adult blue whales, but may prey on young calves occasionally. 23. Research suggests ship strikes are a threat to blue whales, although relatively minor. B. m. brevicauda (Pygmy Blue Whale) Indian Ocean, South Pacific Ocean. “WATCH: Blue Whales 101“, via National Geographic. “Blue Whale (Balaenoptera musculus)”, via Alaska Department Of Fish & Game. “Balaenoptera musculus”, via IUCN Redlist. “Orca pod filmed hunting whale calf in ‘unprecedented’ California killing spree” (2017), via The Guardian. J. Lee (2014). “How Much Danger Do Ship Strikes Pose to Blue Whales?”, via National Geographic.